The Swarovski Optik AT 101 Aluminum Tripod Kit provides demanding users a rugged but lightweight (4.2 lb, 1.9 kg) support. It comes with the DH 101 Tripod Head which together are tailored to your bird watching and nature observation needs, and designed to be used with Swarovski Optik spotting scopes. The AT 101 and DH 101 together reach a unique viewing height of 79.5" (202cm). They are designed to contend with extreme conditions and are rugged enough to withstand heavy use. With just one hand the DH 101's Fast Mount System (FMS) allows your scope to be mounted quickly and easily onto the tripod head and both axes can be set with a single movement. It has a five-tooth locking system which prevents upward or lateral displacement for considerably less movement after setting and greater stability. The integrated leveler aids in positioning and its rubber feet with retractable spikes make this tripod ideal for providing a stable support on any terrain. 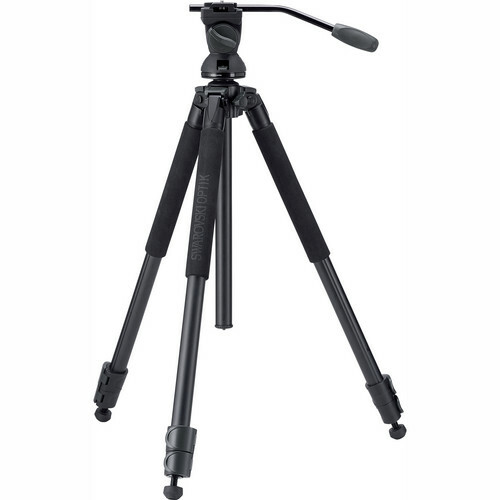 Do you often have to contend with extreme conditions and need a tripod that can withstand heavy use? Then the aluminum tripod AT 101 is the right choice for you. Not only is it extremely rugged, but with the tripod head attached it also offers a unique viewing height of 79.5" (202cm) and weighs just 5.4 lb (2.5 kg). A Swarovski Optik spotting scope offers you high optical quality, sophisticated performance, and innovative design. To use all these benefits to their best advantages, it is important that your spotting scope has firm legs to support it and is mounted in a way that allows you to use it quickly and easily. The AT 101 aluminum tripod and the DH 101 tripod head are tailored to your bird watching and nature observation needs.